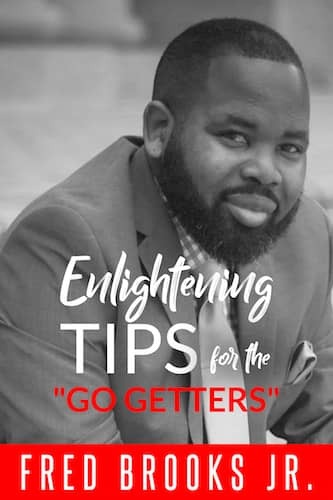 Enlightening Tips for the Go Getters : Fred Brooks Jr.
How do I achieve greatness and success? If you are a “Go Getter”, this is a question that you have asked yourself over and over again. Being a “Go Getter” is a mindset. It is not based on your background, your race or ethnicity, or your position in life. All “Go Getters” want to be great and successful, and they want to know what it takes to get there. In this book you will find tangible tips to equip you as a “Go Getter” to reach your full potential. Fred Brooks, Jr. was born in the Sportsman’s Paradise of Louisiana, and reared in the “Home of the Broncos” in Zachary, Louisiana. He later relocated in July 2012 to Houston, Texas along with his Wife Brittney R. Lewis-Brooks. Fred began his college education at Southern University A&M College in Baton Rouge, Louisiana, but completed his education with a Bachelor of Arts Degree in Business Administration at Ashford University in Clinton, Iowa. Fred also holds an Associate Degree in Process Operations Technology from ITI Technical College in Baton Rouge, Louisiana. He has a career span of 12 years and counting in Sales Operations and Management, with added career ventures in Real Estate. Fred is currently a proud member of the Houston Area Urban League Young Professionals and The Church Without Walls in Houston, TX. Fred is passionate about having his life experiences serve as an encouraging and uplifting guide to positively impact the lives of others.